The Chew: Candies and Cookies and Cakes! Mr. Chocolate, Chef Jacques Torres, joined The Chew crew to make a perfect chocolate cookie on the Candies and Cookies and Cakes episode. 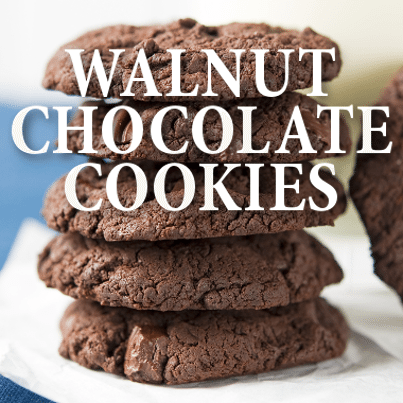 How does a mostly fat-free Flourless Walnut Chocolate Cookie sound? Torres announced that he and his wife are expecting a daughter, who is due in January or February 2015. The couple is excited, but what if the baby does not love chocolate? Torres joked that maybe they could address this problem with therapy if necessary. The Chew crew surprised their guest with an early baby gift with a chocolate theme. He loved the gift. This is a flourless cookie, and the only fats come from chocolate and walnuts. That is because there is no butter or oil in this dish. For more advanced bakers, you could create an edible cookie stand by coating shortbread with chocolate. That seems much more difficult than they made it look on TV! Crush walnuts and chocolate pieces using a rolling pin or mallet. Combine powdered sugar and cocoa powder in a bowl and mix in egg white. Once well mixed, add walnuts and then chocolate pieces. Add vanilla and salt, stirring well as the batter thickens. Let it temper so that it has a shiny look. Use a small scoop to form dough into balls. Place them on a prepared baking sheet, spaced apart because they will expand as they bake. Bake for about 12 minutes at 350 F, or until golden brown. Torres said these are best the next day, so let them refrigerate after baking and enjoy them later, if you think you can wait that long! Hi! What are the measurements ??!! It would help if you added the amount or measurements to the recipe. How. Many chocolate chips? How many walnuts? How much egg whites? Ect. This is not a recipe unless there are measurements of the ingredients. We were told on the show by Jacques Torres to see the recipe on line for the quantities??????? How many egg whites, chocolate chips, nuts? need measurement on eggg whites, walnuts, and chocolate. thank you! Can’t wait to try. Please – we need amounts of walnuts, chocolate and egg whites. Sorry for the confusion! The recipe has now been updated with amounts for the ingredients. I was in The Chew audience when he made these….they are AMAZING.